Katrina Alcorn was pushed to the edge. 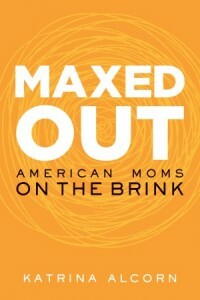 In her compelling memoir, Maxed Out: American Moms on the Brink, she tells the story of how the attempt to balance the twin engines of motherhood and career prompted a mental breakdown. The point of the book is to use one woman’s personal narrative to show that many women with young families are suffering because of the current state of the American workplace. This is true. But, from my perspective, Maxed Out is also about the importance of recognizing limitations: both the structural ones that might change, and the emotional and biological ones that won’t. Unlike Alcorn, I’m not maxed out. You can read my thoughts on why this is so and the work/life dilemma in general here, at Brain, Child Magazine. (Mommy, For Real) Can You Be Maxed Out If Your Boss is YOU? Glad you have.your life in balance .